Landscape photography can be a very solitary pursuit and I find the interaction on Facebook helps put things into perspective a little, and stops me going off on tangents that aren’t really that interesting to others. I don’t go along to any camera clubs and I’m not a member of any photo society, so Facebook is a very useful sounding board for what’s working and what’s not with my photography. It also helps that many excellent photographers follow my page and provide constructive feedback – not always positive! – publicly and through private messages which has greatly helped me grow and develop my own style over the last few years. I was interested to see that Facebook has introduced a “pages to watch” feature, which allows page owners to “spy” on the number of page “likes” other pages are getting. It got me thinking; should I really be stressing about how many page likes I get? Doesn’t that just lead down a road that encourages clichéd snaps designed to appeal to as many people as possible? I kinda like the fact that I have people following my page that have diametrically opposite tastes! There are some who will only “like” dark, moody, stuff, and others that only seem to like a photo if the sky’s blue and the sun’s out! As I’m a scientist by profession and consequently obsessed with mathematical correlations and statistics, I thought I’d use Facebook’s “pages to watch” tool to see how many of these page “likes” actually interact with the photographers they “like”. This is, after all, my reason for using social media, so I was curious to how my 398 page followers compared with those who follow the photographic “big-guns”; those pages with THOUSANDS, in some cases, TENS of THOUSANDS followers. I have to say, I was pleasantly surprised! I looked at the last 5 photographs posted by each page I follow and compared the “likes” each photo got with the total likes the page has. My theory was simple: the more people like your page, the more “likes” your work should get, right? Wrong! It turns out that these excellent photographers are getting, on average, around 2 – 2.5% feedback from their page followers per image. No one would argue that it’s impressive that one page I reviewed had almost 7500 page followers, and it’s equally impressive that 220 – 230 people take the time to show their appreciation of the photographers work by pressing “like” but I was more impressed to find that my 398 followers are much more supportive! I calculated an average 14% feedback on my past 5 photographs! Now, that’s got nothing whatsoever to do with me, or my work, it’s a reflection on the people who are kind enough to pay attention to my page and INTERACT with it, showing appreciation where they like something and withholding that all important “like” where they think I could do better. I’ve always said that I’m amazed when anyone actually takes the time to like or comment on anything I’ve done, but, to find that the people doing it are SEVEN times more supportive than those following some of my favourite artists was, simply, astonishing. So, dear Facebook. Thanks for the offer, but, I don’t need droves of new page followers who don’t actually follow, I’m happy with the people who find my page through friends, or shares, or just chance. When it comes to people: it’s QUALITY- not quantity – that counts! And I’ve been very fortunate indeed to have been discovered by so many quality people! Landscape photographers are fortunate in many ways when compared to our colleagues in other photographic disciplines. For the most part our subjects are static, we do not need to “pose” or cajole them, nor do we need to snap them before they fly off or run away. We do not have the pressure of knowing that we only have one-shot to tell the story we’re after and, despite our ego’s telling us otherwise, we rarely have the stress of knowing that our failure to deliver may well ruin someone’s “special day”. Yes, there can be hours of walking or climbing with back-packs full of heavy gear just to get the shot we want, and yes, there can be delays and frustrations if the weather isn’t just how we’d like it, but, on the whole, I’m glad I’ve chosen Landscape photography and find it a lot less stressful than the other options. The downside of all this though, is that many landscape photographers (and I’m including myself here) become lazy, restricting themselves to only shooting during the “Golden Hours” around sunrise and sunset, avoiding mid-day and poor weather conditions at all cost. How often do we simply roll over and go back to sleep if the weather isn’t looking too promising when we glance out of the window a few hours before sunrise on a cold, damp morning? 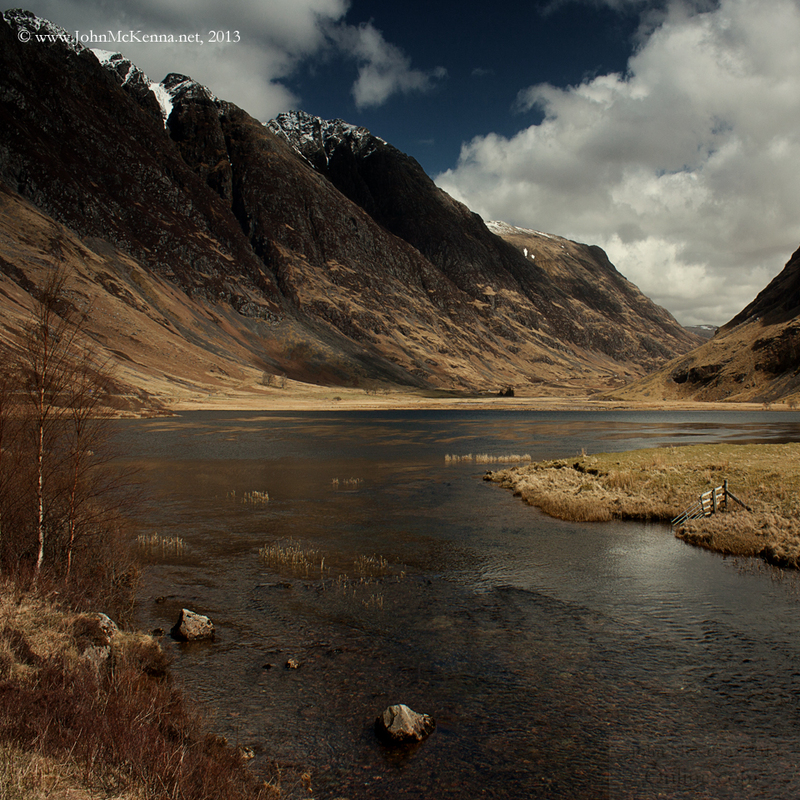 Well, I recently posted a photograph on Facebook of a well-known loch in Glencoe, Scotland. The shot was taken during a particularly rainy day and to be honest, I really wasn’t convinced it was working, but, I persevered and shot a few frames. I was genuinely surprised at the reaction the image got, with more than 3000 views, shares, comments and “likes” within 12 hours of posting it online. Now, while I was setting up this shot I counted three other photographers stop, look around at the scene and leave again without taking a single image. One even went so far as to set-up his tripod, and unpack the camera, stand around for a while hoping the light would “improve” then change his mind and pack it all up again without taking a photo! Now, I’m not criticising this approach. As I’ve said, I’m as guilty as the next person for adopting the “it’ll be better next time I visit” attitude, but, if we adopt the approach of some of our more time restricted colleagues and try to retrieve something from a less than ideal situation, I believe our photography improves as a result. These two photographs were taken from approximately the same location, one in reasonably nice (but cold) weather in April 2013. The other taken during very heavy rain in September 2013. Both shots were taken around mid-day. 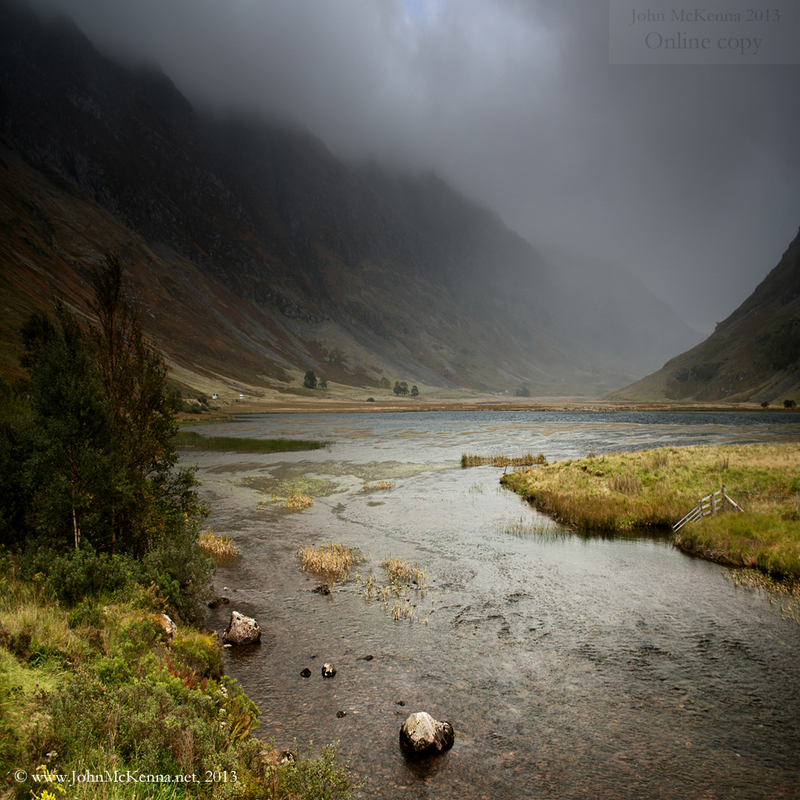 I’m happier with the “bad light / poor weather” shot and feel that it adds to the drama and rugged feel of the landscape. Now, I know this light will not suit all possible landscapes, but, from now on whenever I get the opportunity to set out with my camera, poor weather may influence my choice of location, but, it will not stop me from heading out! Don’t let “bad light” stop you either!